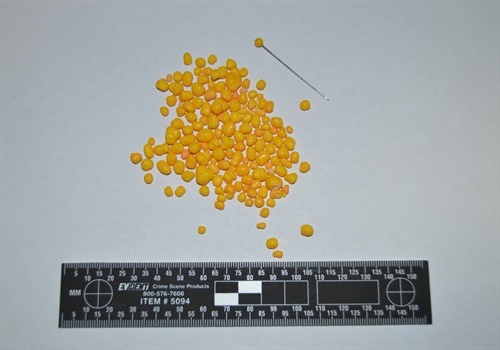 The Omak (WA) Police Department is investigating after two different families reported finding straight pins in trick-or-treat candy handed out to their children on Halloween. Image courtesy of Omak PD / Facebook. The Omak (WA) Police Department is investigating after two different families reported finding straight pins in trick-or-treat candy handed out to their children on Halloween. In both of the two separate incidents, the kids' parents reported finding a straight pin in a small box of Nerds candy, according to KOMO News. The plastic tip on the straight pin was the same color as the candy within the box. One of the Nerds candy packages was turned in to police. "Omak Police Department is taking the situation seriously and an investigation is under way," said Omak Police Chief Jeff Koplin in a Facebook post. "Please inspect all your children's candy and its packaging very closely. If anything suspicious is found please contact the Police immediately. More information will be released as it becomes available."